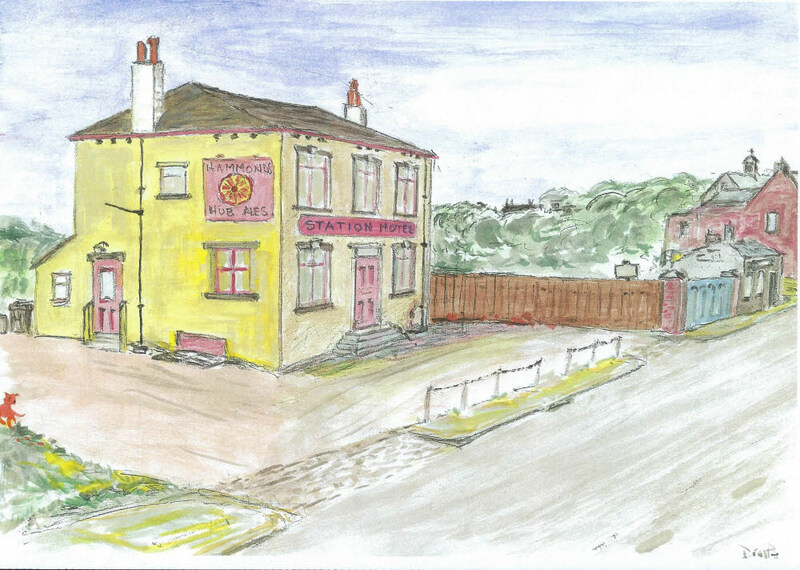 The Station Hotel, situated on the A638 Wakefield to Dewsbury road on Chickenley Hill at Chickenley Heath was a Hammond’s house in the 1950s, as depicted in this sketch. Chickenley Heath railway station was located nearby, hence the name of the licensed premises. The Station Hotel is believed to have started in 1875 as a beerhouse and is shown with St Mary’s Church and the roofline of Owl House on the right. During the 1950s the public house had three different landlords starting with William Reginald Blackburn, known as “Reg”, from 1946, followed by Fred Thornes in 1955 and finally by Joseph Edward Harrison in 1958. The House was closed for trading in September 1969 and the license was transferred first to Frank Cyril Mays and then to Richard Stephens Smith in 1970 subsequent to the closing of the premises.